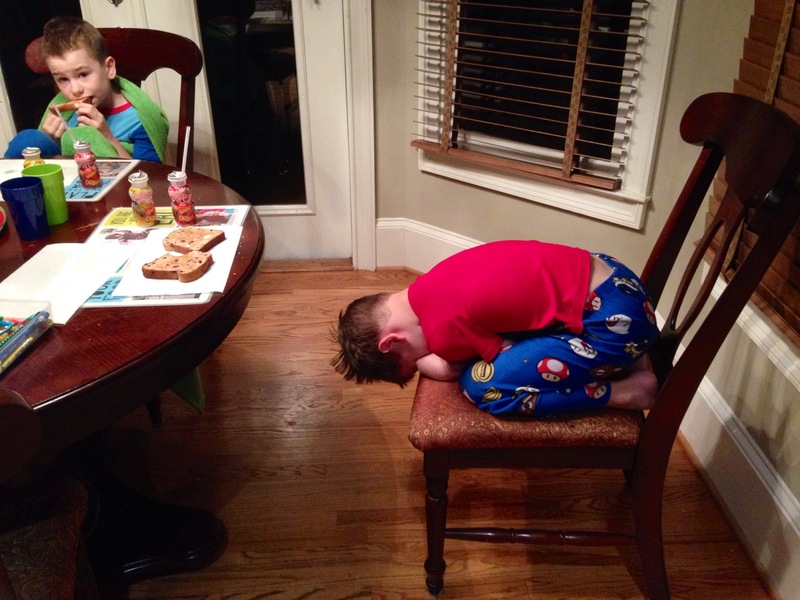 This is how my day started… because there were blueberries in the bread. I always told myself that I would never guilt my children into eating with the phrase, “There are starving children in… (you fill in the blank)” (Did you happen to catch the two key words in the sentence before last? Always and Never) These two words will make a liar out of you quicker than anything else. I have and I do tell my children about the child who doesn’t eat dinner before bed and only has breakfast when he’s able to eat in the cafeteria before school. I think it’s important that they know right outside our door is a world of struggle unparalleled by anything their minds can conceive. I would have been wiser in my approach. In the same way that I don’t want to nag my husband, I don’t want to nag my children. I want to respect and appreciate their different temperaments without catering to their outbursts. Jud Wilhite said something in a recent message that struck me right in the heart. So much so that I made it into a pretty little instagram saying. My lack of patience has always been a glaring character defect and I know better than to pray for patience! But when I view it as the difference between my grace and my wrath it takes on a whole new meaning. More times than I want to admit, my children are met by the monster in my mouth. My words are harsh and my temper short. I can say with all truth, 99% of the time it’s not the boys who provoked the monster, it’s my lack of time management or lack of sleep or lack of coffee. It’s an area where I am lacking (and I know it) rising to the surface and lashing out at the nearest target. Even so, I am learning because of all the grace that has been shown me, that “a bad moment does not a bad mama make.” I cannot press this upon your heart enough. Children are quick to forgive. We must be quick to admit fault. The days when I am able to catch and reel in my spoken thoughts before they are released for others to hear are evidence of my progress. Some days I fail and in those moments I will recognize them for what they are, moments. So…there it is…just one shade of my ugly. It’s all about progress (attainable), not perfection (unattainable). How important to you are the times right after waking and right before sleeping? This entry was posted in Family, Growing up Me, Marriage, Meditation, Pictures Worth a Thousand Words, Raising Boys (to be productive members of society), The Monster Within and tagged Boys, Breakfast, Children, Family, Grace, Health, Home, Jud Wilhite, My Boys, Patience, Sons, Temper, Words, Wrath by Joy. Bookmark the permalink. I was so glad my phone was nearby to snap this moment. You are so right about being able to insert the fitting title. I have been all of those titles and need to remind myself that it’s about progress, not perfection. It’s great to hear from you! I hope all is well! I hope you don’t mind, but I copied your instagram thing. I have an issue with patience myself, but since I have no children as of yet, my issue is with the rest of the world. I’m working with God to try and get this nipped in the bud before kids do come, as they aren’t always aware that what they’re doing is what’s lighting the fuse on my patience timebomb. I plan to print out the instagram you posted, and put it somewhere I see it daily. Maybe it’ll become a mantra, reminding me to step back for a second, breathe, and try again with a new fuse. God bless! Chelsie, of course you can copy the Instagram. I’m happy to email it to you if it would print better. I usually attach a pdf so that it’s easily downloaded. Let me know, I’m happy to send it to you. I’m proud of you for being proactive instead of reactive. Patience is a challenge for me EVERYDAY. It’s important that we realize and embrace that we are not alone in our challenges. There are so many others out there suffering in silence, thinking they’re a bad mom because they aren’t always perfect. There’s no such thing as perfect. I’m so glad you stopped by and looked forward to reading your thoughts on your blog. Love this. I had one child who was a ray of sunshine in the morning and the other who wanted to bite his head off for smiling…and she was the picky eater. Still is..and now my grandson is the picky eater. I simply smile. It’s great to hear from you! I hope you’re well! This is one of my biggest mothering flaws. You definitely aren’t alone. You are right though about children being quick to forgive. Doesn’t it make you less anxious to know that what you may consider your worst weakness is shared by many others.